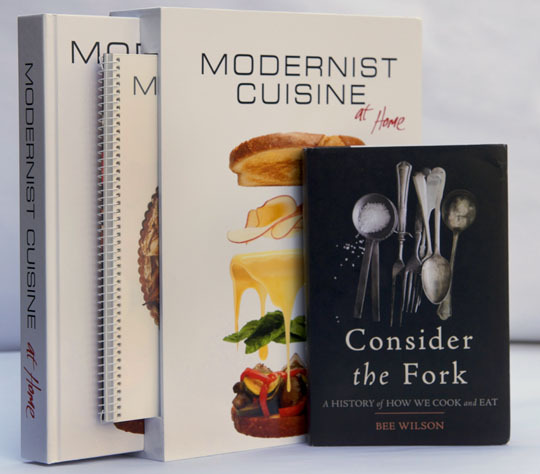 Modernist Cuisine at Home and Consider the Fork are two of my holiday cookbook choices. Photo by Donna Turner Ruhlman. I get sent so many cookbooks we had to build more shelves. So while I don’t get deluged the way the NYTBR does, I do see a good deal of what’s being published. The stuff I get seems to be what publishers are most hopeful about (and therefore worth the price of the book and postage). I will note below the books that I actually purchased (because I already have more cookbooks than I need or even want, that’s saying something), as well as my pick for favorite book of the season (it’s not my own, btw). I was sent the above Modernist Cuisine at Home by Nathan Myhrvold with chef Maxime Bilet, a pared-down version of the incredible multi-volume version published last year. Myhrvold was peeved by my 90% positive and awe-struck review in the NYTimes (that’s an A in my book, Dr. Myhrvold), and this version does take care of one of my criticisms, that it needed serious paring. Well, here it is, pared. And it delivers on the basics of what is now and should always be referred to as modernist cuisine. And it is great for the home, giving basics on sous vide cooking, the best way to use your grill, innovative ways to use the microwave and pressure cooker, and other basics. And the drop-jaw-stunning photography remains. I was surprised not to find the BBQ sauce recipes (since Myhrvold is an enthusiast and expert), which are great for any cook, modernist or not. I suppose they had to ruthlessly pare down. Happily, there are many general recipes for brining and marinades and sauces to keep both the modernist and traditionalist happy for years. The volume is beautifully packaged as you can see. This one costs $99; the big boy is $446 (though prices have been fluctuating on Amazon). Highly recommended for passionate and committed cooks, and a must for professionals. If you’re shopping for the literary and brainy sort who loves to read about food and cooking, Consider the Fork: A History of How We Cook and Eat by Bee Wilson is excellent. 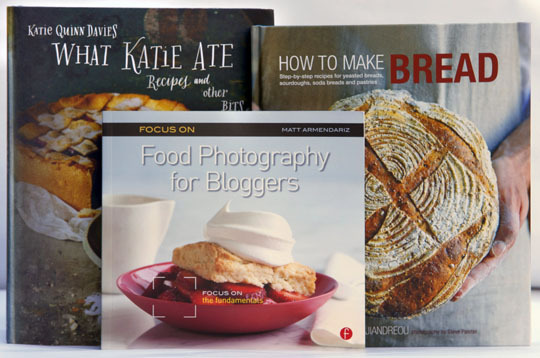 OK, the two I purchased with my cherished dollars are below: How to Make Bread by Emmanuel Hadjiandreou and Focus on Food Photography for Bloggers: Focus on the Fundamentals by Matt Armendariz. Donna and I met Emmanuel on assignment this summer in Gascony where he was teaching at Kate Hill‘s awesome old farmhouse. Donna was so enamored of the book’s photography, she asked me to buy it. The cover alone inspired my 13-year-old son to ask if he could make bread upon returning home from school the day it arrived. I said, “It’s too late to have for dinner but you can mix it today, we’ll keep it in the fridge and bake tomorrow and it will be even tastier.” He said, “Cool,” chose the ciabatta, got out the scale, and the result the next night was killer. My 13-year-old made killer bread. It was an at-table, high-five moment. I bought Matt’s book (we are acquainted and he’s as wonderful as he seems on his blog and in his books), because I am a horrible photographer and I can’t always rely on my fabulous wife to be available. If she’s traveling and I want to post, I want her to be pissed that I’m so good! The book not incidentally got Donna’s emphatic approval. I included the third one, What Katie Ate: Recipes and Other Bits and Pieces by Kate Quinn Davies (which the publisher sent) because it’s beautifully designed and photographed and I trust the author-photographer because her blog is so beloved. Very cool book that likely wouldn’t exist were it not for food blogs. Another fun book, by a sweet man and talented writer-blogger, is Secrets of the Best Chefs: Recipes, Techniques, and Tricks from America’s Greatest Cooks by Adam Roberts. For the gluten-free baker, there’s a new book, Small Plates and Sweet Treats: My Family’s Journey to Gluten-Free Cooking, from the Creator of Cannelle et Vanille, by the Spanish-born pastry-chef-turned-food-stylist-and-photographer (and mom), Aran Goyoaga. Another fine cookbook on an under-written-about cuisine is Japanese Food Farm by Nancy Singleton Hachisu, who lives it. Scroll down for more recommended books, but my favorite book of the year, I don’t even have a copy of it, yet. I had to read it via PDF from the publisher, who asked if I would consider blurbing it. A book on sauces? One of my favorite and cherished subjects! To be a great sauce cook, or chef saucier, is to be a great cook, period. 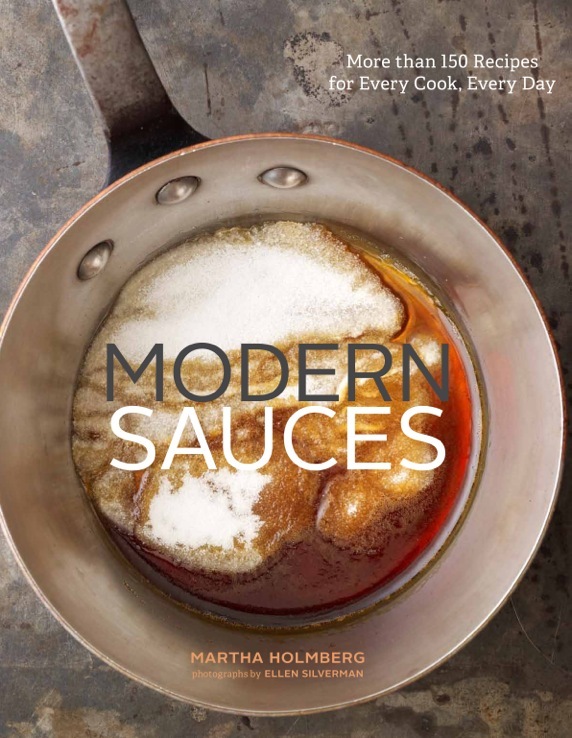 Modern Sauces by food journalist Martha Holmberg is outstanding—I hope a new classic reference book on the craft of sauces. They can be easy, they can be complex. Holmberg covers the whole range and does a beautiful job of it (and Chronicle, which published Ruhlman’s Twenty last year, does its customary high-quality design work). A great book. SPQR: Modern Italian Food and Wine by Shelley Lindgren, Matthew Accarrino, and Kate Leahy, of the San Francisco restaurants A16 and SPQR—what the title says, organized by regions. A Girl and Her Pig by April Bloomfield, was published in, of course, April, but mentioned here because Bloomfield (The Breslin, Spotted Pig in NYC) is one of my favorite cooks in America. Eat with Your Hands by Zak Pelaccio, from founder-owner of Fatty Crab and Fatty ‘Cue, food so personal and quirky it defies description and answers the question, “Why do we need another cookbook?” Because they’re about more than recipes, they describe a philosophy and personality. This is a perfect example. Sugar Shack au Pied de Cochon by Martin Picard—if you need to ask why I don’t hesitate to recommend everything readable and edible by this man, then, well, you need to find out. The Preservation Kitchen: The Craft of Making and Cooking with Pickles, Preserves, and Aigre-doux by Paul Virant and Kate Leahy, Emilia’s find and again, the title says it all. If you need to know why this blog would recommend this book, you’re here by accident, so Welcome! Forgot to add if there’s a book you want to recommend, please share! How does Modern Sauces compare to Peterson’s book on sauces? Granted, you probably can’t have too many books on sauces, but I was curious as to the similarities/differences. I have peterson’s sauces and like it and his other works very much. This book is more comprehensive, more contemporary in feel without straying from the classics. She’s got sound fundamentals, isn’t afraid of the classics, and embraces the new. I just loved it. I really want to buy Modernist Cuisine at Home. However, there are a lot of better things one can do with $100. It is just too much to pay. There are a lot of other areas of cooking to explore and cheaper (even free) sources of information. Thanks for the other book recommendations. A few of them will likely end up on my shelf. If you can’t afford a $100 cookbook, then you likely can’t afford many of the ingredients and tools used in the book. But $100 is not “too much to pay” – it’s a fair price considering the physical book(s) itself and what went in to its creation. There are plenty of frugality cookbooks for misers if that’s your thing. I agree with hugh on all points. $100 is relative, and if you don’t want to spend your money that way, then you definitely shouldn’t. I’d like to underscore what a steal Bouchon Bakery is on Amazon (which is why the books been on the best seller list for several weeks now). Afield: A Chef’s Guide to Preparing and Cooking Wild Game and Fish by Jesse Griffiths is fantastic even if one does not hunt or fish. wild game and fish. is that new? because hank shaw’s book on same subject came out last year and is also superb. I am loving Magnus Neilson’s ‘Faviken Cookbook’. Not that I will ever be brave enough to make the recipes, but it is so inspiring and beautiful! Did PETA launch a campaign against Bloomfield’s book or something? Those Amazon reviews are depressing. maybe! I love april’s book. She’s a cook’s cook. I’m getting “Ruhlman’s Twenty” for Christmas. I’m a novice cook but been exposed to good cooking my whole life thanks to my mother. So I hope your book provides me the necessary knowledge and techniques to tackle some other recipes in cookbooks I’ve purchased but have been hesitant to try. I’ve also bought Roberto Santibanez’s “Truly Mexican” to learn the fundamentals and techniques of Mexican cooking. diana kennedy is considered essential for learning mexican cuisine. ad hoc at home remains a phenomenal book with great recipes for the home cook. I appreciate you taking the time to respond. Would you happen to know of a good book that thoroughly goes over how to store different types of food, what to store it in, how to avoid it from absorbing unwanted smells or flavors and how long it would last (cooked or uncooked)? Also, is there a book that gives advice on how to organize a home kitchen? best is a food saver. 2nd best is ziploc vacuum seal. rules: keep air off food. wrap food well. that’s about it. air and light are the enemy. You will LOVE “Ruhlman’s Twenty!” Like you, I’m a novice cook from a family of good cooks. I’m slowly working my way through RT, and so far, all of the recipes have been superior, and the techniques have really improved both my cooking and my ambition to try more.. It’s an interesting read even for those who don’t cook, but love food. No Affiliation, Yada, yada. Gerry, I’m really looking forward to mastering all the 20 techniques! Now that I am older I realize how thankful I am for being exposed to good cooking at an early age. My mom would be in the kitchen all day making Mexican, Chilean and other various latino dishes for our family. As an adult i’ve exposed myself to good food by eating at all kinds of restaurants. I believe that eating out gives an individual a good perspective of different styles of cooking and give us an idea of what type of cuisine we feel passionate about. For now, I’m going to focus on what I know and that is Mexican but I hope to venture out to other cuisines like Japanese, Vietnamese and Scandanvian. Best of luck with mastering the techniques in Ruhlman’s Twenty, cheers! And now this post, in which every book’s link is to Amazon.com. If we need to talk, let me push the conversation. You’re up front about your relationship with Le Creuset and Open Sky. I’m good with that, and glad for you. But I have to ask, do you also have a deal with Amazon.com? If you do, and you’re not telling us, that’s another thing all together. Why aren’t you up front about it? If you don’t, then a little attention to the human side of bookselling would be appreciated. Let me push a little further. I used to get to your home town fairly regularly. No, I’m not a stalker–between your blog and Bourdain, many of us know what town you live in. I never got to that great used book warehouse I saw on “No Reservations,” but I wish I had. I do have a relationship with Amazon in the form of its associate program. Amazon pays me a percentage of any sale someone makes who has gone there from my site. This is basically what pays for the blog. I wouldn’t recommend anything I would not buy myself. I work hard to recommend only the stuff I personally care about. I also provide a lot of information through this site. As it costs my readers not a cent, and as many readers have generously asked how they can contribute to the blog because they value it and want it to continue, I think it more than fair that when I recommend a product, I get a small percentage from Amazon. That said, I believe in complete transparency so maybe I should have this in the side bar. I don’t want anyone contributing to my site if they don’t like it. I’m going to redesign this site in the new year and maybe I’ll make this clear. I too value face to face recommendations but these are more likely to come from user comments in the future. I always try to comment on products I love (my audible.com reviews for instance). Last Christmas, an author friend specifically went to a B&N to support bookstores, and they didn’t have a single volume he was after, all current hardcovers. There’s no standing in the way of commerce. As Steve Jobs said of producing in China, “Those jobs are gone and they’re not coming back.” Get on the train or get run over. Innovation is where America must lead now. I could go on, but i’ve got to work. OK, that’s fair, and I hope to see that transparency. Enough said, except to say it won’t stop me from stopping by…. Everyone is trying to make a buck and save a buck. I for one cherish my in person interactions with retailers if shopping at their stores is a pleasurable experience; however, they need to be competitive too. If the spread between online and in person at my local shop for non food products is only a few dollars and I’m in town, I usually buy local. But if it is more, plus tax, plus the fact that I do not live close to many shops (i.e. time and gas), Amazon all the way. I don’t yearn for the days of the milk man or home coal delivery or going to stores that do not carry what I want. Does your store offer hyperlinks to all the inventory you sell plus reviews? I enjoy Michael’s FREE website and I hope it stays that way. Great list! I’m shameful cookbook collector 🙂 I am only missing How to Make Bread and Modern Sauces, but only for as long as it will take for Amazon to deliver lol. MCAH has really opened my mind to Modernist Cuisine. It is definitely very user friendly and my children now insist I make their Mac & Cheese variations all the time. Also completely fell in love with Sugar Shack and I will say that the Duck Fat Pancakes are absolutely incredible! SPQR took me by surpise and I will make the chestnut ravioli for a Christmas dinner party. Bouchon Bakery is providing quite a bit of inspiration in the Miss Daisys for my Daughter’s upcoming birthday. I did want to suggest one book to you, Homemade Winter by Yvette Van Boven. Just an incredible array of homemade goodness, so comforting it almost feels like a warm hug (oh and the guinness fruitcake is pretty awesome). I liked this book so much that I turned around and ordered her first Homemade. Sorry just saw this. Homemade Winter is published by Stewart, Tabori & Chang. It is being marketed in the U.S. through Abrams. First $100 is alot of money for many people, Don’t be a snob and write down your nose at folks no matter who you are or one day you may end up eating those crowish tones without the necessary seasoning! Second, Check out Jacques Pepins complete techniques cookbook. This is a nice book for filling in the blanks someone may not know in their culinary adventures. $100 is a lot of money here as well. Hope you weren’t suggesting I was looking down nose. And the collected Pepin is HIGHLY recommended. I haven’t gotten through my entire stack of this year’s new books yet, but so far, Burma: Rivers of Flavor is my favorite of 2012.
hadn’t heard of. so so many titles out there! I think people have lost sight of the fact that these are Michael’s favorites and HIS pick list lol. Yes $100 is a lot money for a book. I actually saved for MCAH in anticipation 🙂 If you can’t afford that then don’t buy it! Many others on this list are very affordable and if you are wanting to learn that cuisine there are other books out there, but they really don’t compare. What’s with the Amazon hate? I am an avid cookbook collector and source books from all over the world. I shop locally when I can but use sites like fetchbook, Jessica’s Biscuit, Omnivore Books, Powells, B&N, and yes Amazon, when I can’t find what I want locally. What Amazon has done is made it relatively simple (thank god) for a blogger to set up a store through their associates progam (yes I am an associate too). I’m a little of berating those who choose to take on advertising too. The income is mere pennies compared to what most personnally put into a site, but every little bit helps. I think Powell’s may do something similar as well. If there are other bookstores that will do this I would love to know. I love Hank’s book as well. Afield is more thorough with it’s focus on hunting and fishing (not foraging) and I appreciated it a lot for the detailed pictures about cleaning wild game and fish which Hank’s book does not have. There is one other book I wanted to suggest. Yotam Ottolenghi & Sami Tamimi’s book JERUSALEM. In all honesty I can cook out of it every day of the week and be content. It’s published by Ten Speed Press. Nice, didn’t know about this one, thanks vivian. Great profile of Ottolenghi in this week’s food edition of The New Yorker. I love both his books, Jerusalem and Plenty. What makes the bread section of the Bouchon Bakery cookbook groundbreaking? I’m surprised to see that you didn’t list “An Everlasting Meal” from Ms. Adler! Thank you for explaining about Amazon. I just ordered Bouchon Bakery via the link. I am pleased that you benefit from your hard work. I appreciate you and look forward to your posts. And your next book whatever it may be. I am a huge bbq/meat enthusiast. That being said a lot of bbq cookbooks are kinda the same old thing in different form. However, Charred and Scruffed by Adam Perry Lang is outstanding. He goes through start to stop the primal yet elegant cuisine we all have come to know and love as BBQ. From basting, to cooking techniques, preps, to finishing salts and board sauces it is fantastic. I sat down and read through it in a night. Amazing! Thanks for the list my amazon wish list just got even longer. Now to adapt what I learn to my BGE!